The loss of bird species has happened even though much of the Mojave Desert is protected national park or preserve, including Death Valley National Park, one of the nation's largest. "This is a shot across the bow of our nation's national jewels, telling us that climate change is already having an adverse impact even in our largest national parks and wilderness areas, and that we have got to reduce dependence on fossil fuels by smartly employing green energy," said Steven Beissinger, senior author of the study and a UC Berkeley professor of environmental science, policy and management. Rarer birds, such as the Virginia's warbler, red crossbill, mountain quail and Lawrence's goldfinch, are now even rarer. 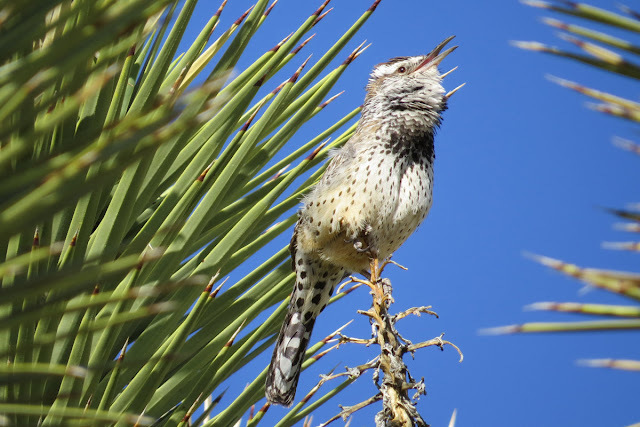 Birds that are more adapted to the desert – the roadrunner and cactus wren, for example – and birds that can live in a variety of habitats, such as the Bewick's wren and California towhee, fared better. Those adapted to grassland or forest did worse. "A lot of these birds aren't exclusively limited to the desert," Iknayan said, noting declines in relatively widespread mockingbirds, killdeer and various sparrows and flycatchers. "Protecting their populations across the whole range can help a lot of these species to persist into the future." 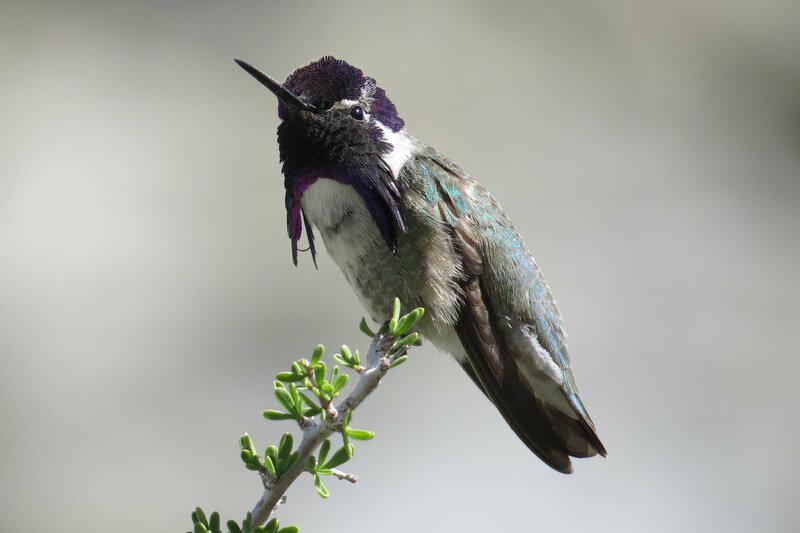 Breeding bird surveys conducted by citizen scientists dating back to the 1970s confirm the drop in abundance in the Mojave, "which is why we think we are seeing a new, lower baseline" for desert bird populations, he said. "Studies elsewhere have found that climate change typically makes places unfavorable for some birds but opens the door for others to come in," Iknayan said. "In the desert we are not seeing increases in any of our species except for the common raven. There are a lack of climate change winners in the system." Beissinger leads the Grinnell Resurvey Project to survey again areas of California that UC Berkeley biologists surveyed nearly 100 years ago, starting in 1908 with the arrival of Joseph Grinnell to head the campus's Museum of Vertebrate Zoology. The goal of the project is to understand the changes wrought by human occupation of the state, including the impact of global warming and climate change. 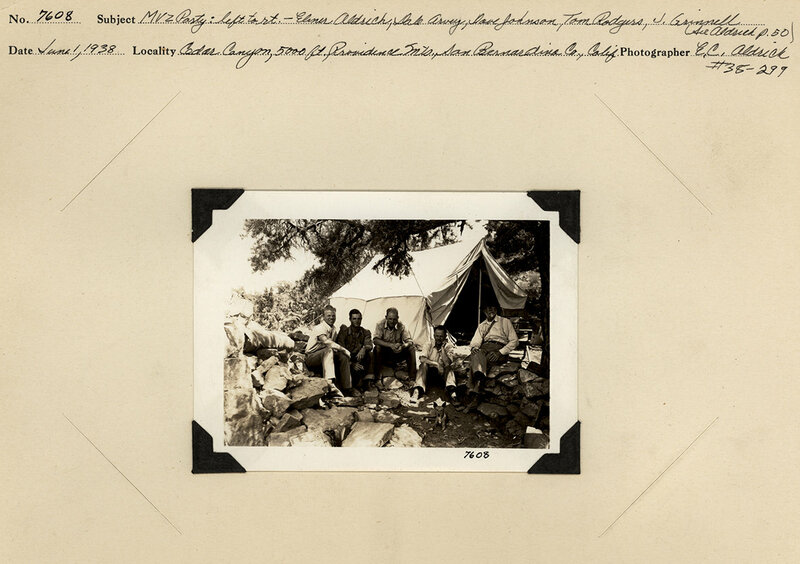 Joseph Grinnell, right, and members of his survey party of 1938 in the Providence Mts. of San Bernardino Co. Thanks to Grinnell, who introduced a now-widely used method of recording field notes, today's scientists have detailed data about bird and mammal populations and occurrence throughout the state, ranging from the Sierra Nevada and Cascade ranges to the Coast Ranges and Central Valley, and encompassing Southern California and, most recently, the deserts of the state's southeast. Grinnell and his students conducted and dutifully recorded their observations between 1908 and after his death in 1940. Iknayan and her colleagues visited the 61 Mojave sites, including 9 in Nevada, that Grinnell and his colleagues visited between 1908 and 1947. She spent three consecutive days at each site walking a path as close to Grinnell's as possible, stopping at 10 places along each path and recording all the birds she saw or heard within 7 minutes. She and Beissinger then conducted a statistical analysis to take account of the fact neither Grinnell nor Iknayan detected all the birds living at a site. The result was a chart of "occupancy" for each of the 135 birds, representing the proportion of surveyed sites the birds actually inhabited, even if undetected, in the early 1900's and now. "The study is clearly showing an erosion of the number of species and the diversity at these sites that is pretty striking," Beissinger said. "The Mojave Desert is now nearly half empty of birds. Is this a bellwether of changes to come in other protected areas?"